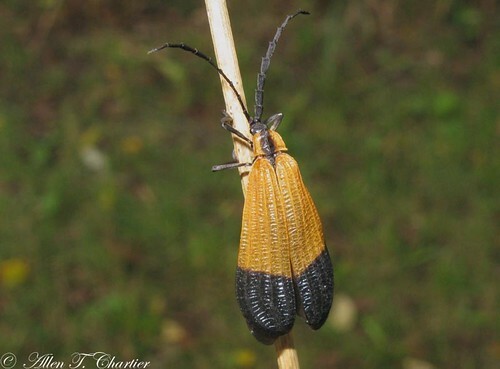 This is a large, colorful, net-winged beetle. It is usually found resting on vegetation in moist woods. The body is 5 ⁄16″ to ⅝″ long. Males are smaller than females. The hardened forewings (elytra) have pronounced longitudinal ridges and a network of less distinct cross ridges. They are broadest toward the rear and extend beyond the body. The lower half of the wing (near the head) is yellow-orange, the upper half, the “band”, is blue-black. They do not have a median black band. When viewed from the side the elytra are wavy and there is a depression just below the terminal black band. The pronotum covers most of the head. It has yellow-orange markings on the sides. The antennae are long, thick, and saw-toothed. The eyes protrude. Juices of decaying vegetable matter. Females deposit eggs on dead or dying trees. Distribution Sources: 7, 24, 29, 30. The hardened forewings on an insect used to protect the fragile hindwings, which are used for flying, in beetles and true bugs. The saddle-shaped, exoskeletal plate on the upper side of the first segment of the thorax of an insect. Found in my woods. I learn something new every time I go there. Is it displaying, cooling off, showing off, stretching, exercising, testing the air, or just having fun?